Could this spell disaster for us cattle producers? I've been watching this story unfold and I can't help but think when I see whitetail deer off in the distance if this could be catastrophic to my herd as well as others? It's the ability to mutate that has me deeply concerned. I hope there are some experts that will chime in on this thread and give some reassurances. Re: Could this spell disaster for us cattle producers? No issue to beef cattle. Governments are not serious about dealing with it yet. If they were, DNR would shorten the hunt season and take off any tag limits. When you have parts of the US like southern Michigan where the deer population is upwards of 300 per square mile, you no longer have healthy populations - just cesspools of disease. I would be far more concerned with the other diseases that deer do transmit to cattle, before CWD. You make an excellent point. When wildlife populations exceed healthy levels, they become a genetic pool for disease agents - parasites and microbes. If you going to worry about anything it’s hogs! They are already impacting herd health. I had a dream about 2 weeks ago that I went out one morning and feral hogs were all over the top of my ridge. I guess I have read too many of the posts by you guys in Texas. It was a nightmare. I was glad when I woke up and realized it was only a dream. I was reading an article a while back that a cattle farmer used hog manure as an ingredient in his cattle feed, not sure how trustworthy the author was. If we did that here we'd be hung drawn and quartered! 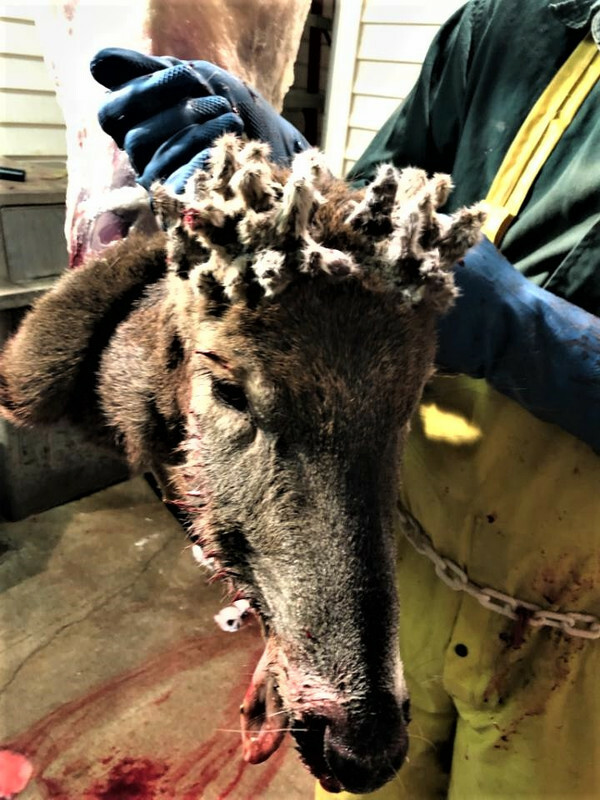 Have no idea if this is the result of chronic wasting disease - or something else - but a friend/neighbor shot this about 3 miles south of our ranch. Another friend of his got one west of town but it had significantly larger "cauliflower buds" with velvet. Makes me wonder . . . .
Not good! I would rather have the Black Vultures. Could be a disaster...... everyone should immediately high fence their pastures.